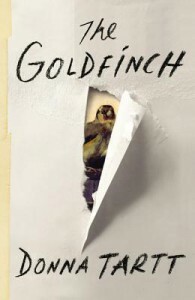 My review will not do justice for THE GOLDFINCH, nor will this book affect others as much as it affected me. Bottom line: for those looking for near-literary genius this book is incredible. It took Donna Tartt nearly ten years to write this book, which Amazon awarded the number-one spot in their Best Books of 2013. Believe the hype. Tartt poured every ounce of her literary firepower into making this book spectacular. The descriptive writing comes off as effortless—every description hits every note of nuance perfectly (I was amazed at the level of knowledgeable research: everything from Dragon Ball Z and LARPing, to fine art and high-society Manhattan culture). Allow me to give a bit of a non-spoiler story summary. Theodore Decker, aged 13, ends up taking a stop at a museum (presumably the Frik) with his mother. An explosion sets off the events of Theo’s life, including the smuggling out of the priceless eponymous painting. The book is segmented into the various stages of Theo’s transition from teenager into adulthood, moving about the country, with the constant MacGuffin reminder of “his” painting. There are multiple stories to be enjoyed, my favorite being Theo’s family life, as well as introductions to the gangster-ridden art underworld. Tartt hits the top of her crescendos when Theo is left alone, where his mind can stew. Not many authors are capable of solo scenes, but this is where Tartt shines. The last couple-of-hundred pages present the deepest of meta-philosophical thought that carries through long after the book’s closure. Make no mistake, the rest of the book is treasured—her dialogue is realistic and always in conflict—but Theo’s solo scenes were my personal highlight. People interested in literature should take no second thoughts of diving in headfirst. Writers should study this book as if it were classic art. Lexiconists will appreciate the careful assembly of words. If you’ve been waiting to read a book of great literary value, this is it.